With a feeling of common purpose, I’m sitting amongst a sea of yellow in the first floor meeting room in Sarasota County Administration building in Florida. The call by the Friends of the Legacy Trail and the local bicycle organizations to attend the February 15, 2017 meeting is an overwhelming success. Not only are there about 100 supporters of the extension of the Legacy Trail in the room, but 300 sent emails and many others made phone calls. The call to action was issued because of the possibility of a 2 year delay in the financing of the Legacy Trail Extension to Sarasota. Looking down on all the yellow shirts, the commissioners clearly get the message. Commissioner Alan Maio near the end of the meeting declares something to the effect that, “I suppose I shouldn’t say this, but please don’t send any more emails. There were 300 of them and we had to read them all.” Afterwards he mused that he was happy that only three of them were not very polite. The implication is that the commissioners are already on board with the Legacy Trail Extension Project. The support by the commissioners is not really surprising given that the Legacy Trail Extension will have many benefits for Sarasota County and Sarasota city in particular. In fact, past studies on the benefits of trails have concluded they are among the most popular public park facilities that can be funded by government agencies. The connection with existing Legacy Trail (considered a sunk or already paid for cost) will benefit the economics of a new trail extension. Connecting the existing Legacy Trail to a major population center means it likely will become a major commuting route. The new extension will cut through areas with more commercial activity, so this should help business development. Property values will rise along the new trail as people want to move closer to it for both recreational and commuting purposes. Thus, the public and country commissioners support the project and the potential benefits of the trail are quite high. So what is the problem? The bump in the road-or more aptly the trail-no doubt was caused by sticker shock. At the February 15, 2017 meeting the commissioners revealed that a contract (a letter of intent which is legally binding) had been signed for $38 million by Trust for Public Land to purchase the land corridor owned by CSX Corporation. Eventually this land will be turned over to Sarasota County. In addition, it is estimated that construction will be about $15 million. Although this would be a small part of the county’s 1 billion dollar budget, it is a lumpy investment. Dealing with major initial expenses whose benefits will trickle in over a long period of time is always a problem for infrastructure projects and the reason why they are often financed by loans or bonds. My experience with such trails is to a large extent based on a trail I ride on every week when I’m home in Washington, DC. Similar to the future Legacy Trail Extension, the Capital Crescent Trail runs from Bethesda to Georgetown through the heart of Washington DC. This trail is now over 25 years old and has become a major commuting route for bicyclists. The number of annual riders now exceeds 1 million. Because it was created over 25 years ago it is not nearly as well designed as the Legacy Trail. At 10 feet wide (compared to Legacy Trail 12 feet) and with pavement cracks caused by tree roots, it is clearly in need of resurfacing. For anyone interested I have written a short history of the trail for this site. The fact that this major bicycle artery into Washington, DC even exists is a miracle. The trail is in two jurisdictions: Montgomery County and the District of Columbia. An article in Bethesda Magazine gives a short history of the project. In 1988, Montgomery County purchased the right-of-way from the D.C. line to Silver Spring under the National Trails Systems Act. Two years later, the National Park Service purchased the other portion of the right-of-way, stretching from the Maryland-D.C. border to Georgetown. The 7-mile trail from Bethesda to Georgetown was paved with private and public funds, and was formally dedicated in 1996. The National Park Service which owns quite a bit of land in the District (i.e., Capital Mall, Rock Creek Park and C&O Canal) stepped forward to purchase the land in Washington, DC. Montgomery County and the National Park Service each had to pay about 10-12 million for land acquisition. This would be much higher in today’s dollars. All this wheeling and dealing was coordinated by the Coalition for the Capital Crescent Trail. Today after over 25 years the existing trail is finally to be extended into Silver Spring, Maryland. An extension of that trail is planned pending approval of a controversial Purple Line light rail from Silver Spring to Bethesda. For years this unpaved route has been called the Capital Crescent Interim Trail. Under the new project the bike path will be completed and paved all the way to Silver Spring at a cost of $90 million paid mostly by the Montgomery County. 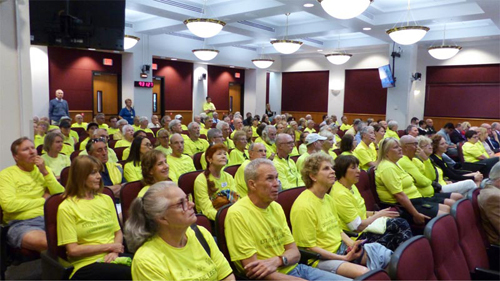 Sitting in a sea of yellow at the county commissioner’s meeting on the trail I’m struck by a larger issue. Why does it take mobilization of bicycle friendly groups such as the Friends of the Legacy Trail or the Coalition for the Capital Crescent for bicycle projects to be funded? Shouldn’t the department of transportation or public works (either city, county or state) have public funds available for such local projects? The answer to this question is that progress is being made all across the country on financing local bicycle infrastructure, but unfortunately we still have a long way to go. 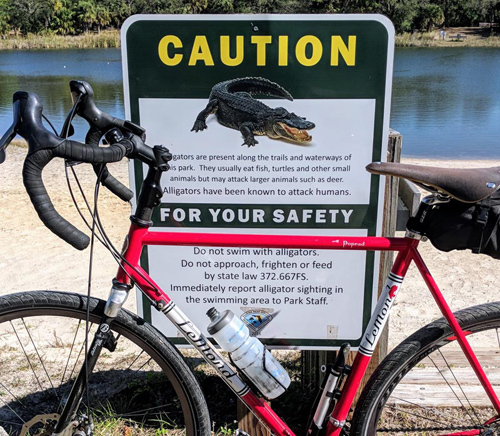 Full credit should go to the local bicycle organizations such as the Friends of the Legacy Trail for filling the gap in financing local bicycle infrastructure projects and advocating for the right projects in Sarasota County. The recent wave of yellow at the county commissioners may have avoided a possible delay, or even cancellation, of the Legacy Trail Extension project. As it stands now, the county would be crazy to void an existing contract that apparently is 15% under the appraised value of the land. Keeping together this land also is a unique opportunity for promoting recreation and commercial development of areas near the trail. Integrated into new multimode traffic planning models it also would lead to a reduction in the commuting traffic clogging city streets in Sarasota. With $20 million due for the purchase of the right of way in December, 2017, there is more work to be done. The next step is to figure out how to raise the money for the extension of the Legacy Trail. In addition it is important to consider how to make more bicycle infrastructure as a more serious part of state, county and city budgets. Safer and better bicycle infrastructure in Sarasota County would surely make bicycling as common as walking down a city street or driving a car to the local store. It’s a complementary activity that should part and parcel of infrastructure development, rather than an add-on competition for city or county funds.